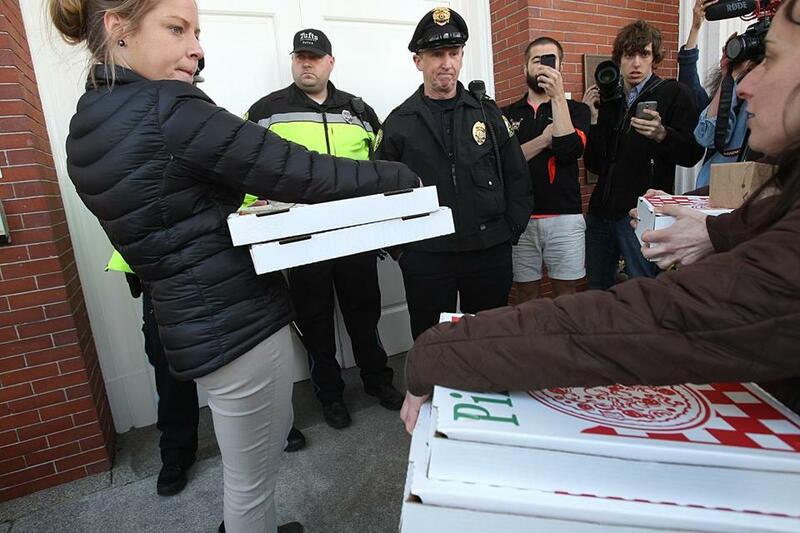 Tufts University police prevented pizza from being delivered to protesters sitting in at Ballou Hall on Friday afternoon. 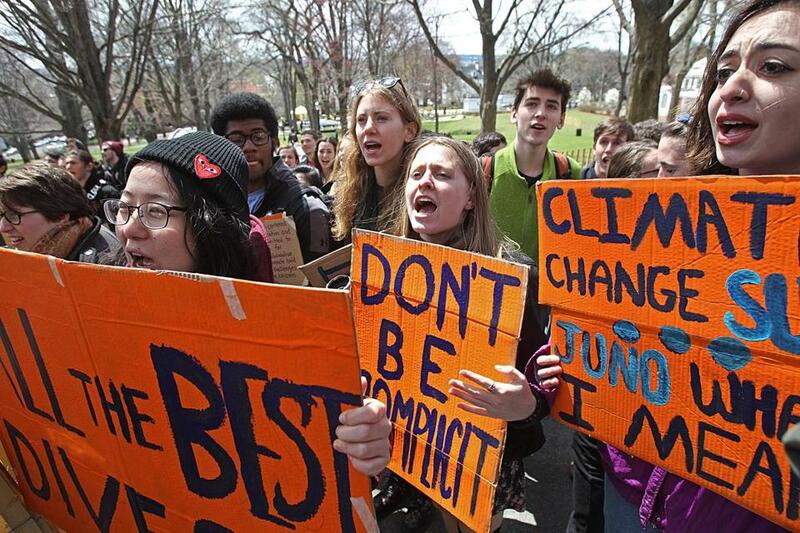 A 55-hour sit-in at Tufts University ended Friday evening after administrators promised that students who were protesting the school’s investment in fossil fuels could meet with trustees. A spokeswoman for the student group, Tufts Climate Action, called the three-day protest a success, and said they would continue to push the university to divest. “This day was a win,” Shana Gallagher said. The sit-in was the latest in a series of protests at colleges around the country recently to urge fossil fuel divestment. Last week, a group of Harvard students and their supporters rallied in Harvard Yard and blocked administrators from entering their offices for a week. Seventeen of the 33 students and alumni who began the sit-in Wednesday had remained Friday. Earlier in the day, Tufts officials had said students they could face disciplinary action if they continued to occupy the office of president Anthony Monaco. Tufts students rallied outside Ballou Hall in support of demonstrators inside protesting the school’s investments. Protesters from the group, who entered the office in Ballou Hall Wednesday morning, said administrators warned that they could be placed on probation or suspended. University spokeswoman Kim Thurler said seniors participating in the protest could lose privileges associated with graduation. “The students chose to disregard university policy by entering and occupying a private office despite clear instructions by Tufts police officers not to do so,” Thurler said in an e-mail. The college said it had not determined whether protesters could still face discipline. Dwindling provisions contributed to the decision to end the protest Friday. Administrators blocked food from reaching the protestors, including pizza delivered by the janitor’s union. Protestors had only packed enough for three days. On Friday afternoon, they signed a written agreement with the administration that grants students a meeting with trustees next semester. The college also said an outside specialist will meet with Tufts’ endowment oversight committee to discuss divestment. The students sought to meet with Monaco, who had been traveling and Friday was committed to a full day of meetings, Thurler said. The university has said it will continue to consider the possibility of divestment in the future.